Pippa’s 2019 RORC 600 all female crew is building! In addition to Renate, Pippa will be joined by 2018 crew members Ali, Carrie & Karen, along with Anna, and Tara. Seven so far which means just one place to fill. 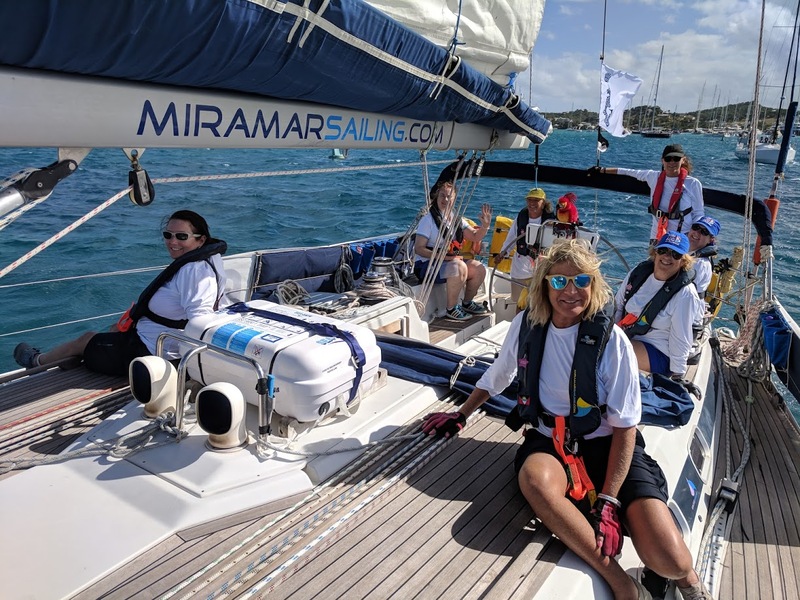 Pippa is still recruiting and aiming for a maximum of 8 to get the Miramar Sailing yacht Phoenix around the 600 mile race track in the allotted 5 days. In 2018 her CSA rating of 0.810 was very favourable and this is likely to remain for next year. February 10th to 13th – Boat Prep and Safety Briefing – done properly this should be a breeze. We have had our yacht “Phoenix” (Grand Soleil 46.3) UK SCV coded (Code 2) so she has been through the mill in terms of safety and is ready to go in that respect. In September we sailed her to Grenada and had both toe rails re-bedded, and some loose teak deck planks re sealed. We only purchased her in December 2017 so we were a little green about her capabilities in the 2018 event. I have a lot more experience of sailing her and will be less conservative in my sail setting next time. Our First Mate, Anna, also a RYA Yachtmaster Instructor on our school team, is an experienced racer who will be very valuable, and support me, in this department. February 18th to 22nd – RACING!!! February 23rd – Return to Jolly Harbour. You, of course, are welcome to join any time before Crew Muster. A 25% deposit will secure your berth.